My skirts and summer dresses are ready to go in my closet. It’s finally nice enough outside to wear them! In the winter, I could get away with not shaving or waxing if I was feeling lazy. The summer, however, is a completely different story. I will not go out in public with hairy legs. I wouldn’t want to scare anyone! In the past, I was regularly going to our local salon for waxing. However, it does get very expensive especially when I needed to go every 3 weeks. My leg hair grows at a super sonic rate it seems. To save some money, I’m dealing with all my hair removal needs at home. I recently had the chance to try a few products from the Veet Natural Inspirations line and have been loving the results. Veet Natural Inspirations is the first collection of depilatory products that contain up to 100% naturally sourced ingredients. I was pleased to see that I recognized many of the ingredients in the products like grape seed oil, argan oil, shea butter, aloe and more. They promise to give you long lasting smooth results for up to 28 days for wax products and twice as long as shaving for cream products. The collection includes cream depilatories and wax strips for the body and face. 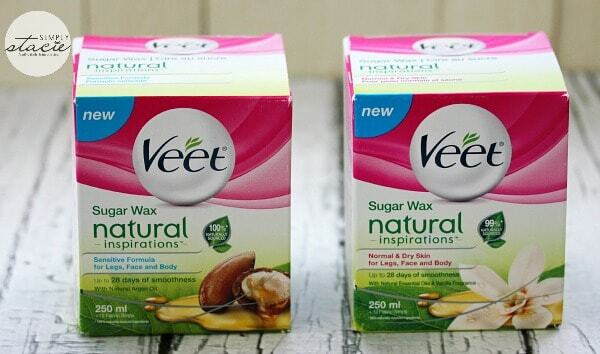 It also has a brand new product and it’s a first for Veet: a new sugar jar wax! This sugar wax reminds me of the wax they use at our local spa. It’s made from 100% naturally sourced ingredients like argan oil and vanilla oil. It also comes in two varieties: Sensitive Formula and Normal & Dry Skin. 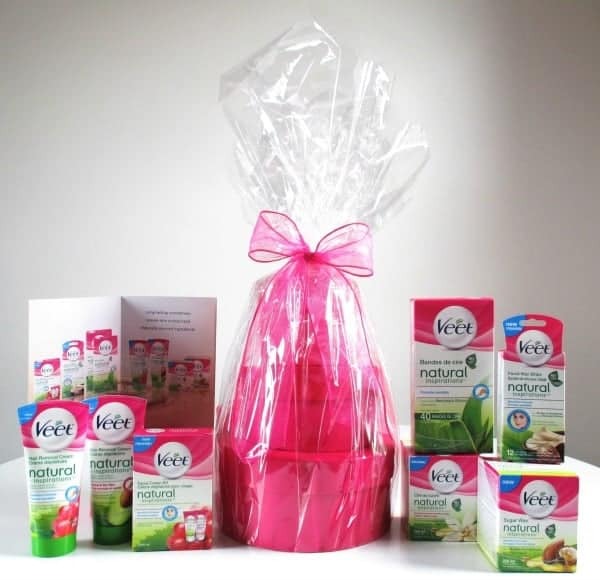 Each pack contains 1 250 mL Sugar Wax, 1 Precision Spatula and 12 Reusable Fabric Strips. You can use it on your legs, arms, underarms, bikini line, upper lip, cheeks and chin. They suggest your hair be 5 mm long before you wax for the best results. In preparation, I warmed the wax in the microwave according to the directions. You can also heat it up in boiling water. I thought it was neat that the precision spatula indicates if the wax is too hot. Using the spatula apply a thin layer to the area you want to wax. Then apply the fabric strip and rip away as quickly as possible. The faster you pull, the more hair you’ll remove. It was a little messy to use, but nothing that couldn’t be cleaned up with some water. I used the Sensitive Formula and didn’t find it painful at all. It was a just a wee bit uncomfortable, but nothing like the waxing I’ve had done at the salon. I washed off any excess sugar wax in the shower afterwards. My legs felt soft, smooth and hair-free! 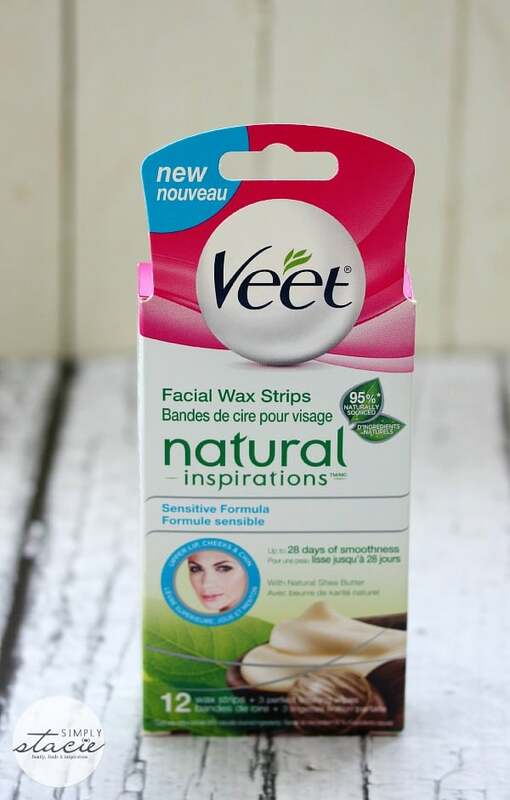 Veet Natural Inspirations Sugar Wax has a SRP of $17.99. This product is made with natural grape seed oil for sensitive skin and natural avocado oil for normal to dry skin. It promises smooth results for up to two times longer than shaving. It’s also designed to work on those short, stubborn hairs that are a pain to remove. It’s very simple to use. Apply a thick, even layer to cover the area you want to remove and then wait 5 minutes. At the 5 minute mark, test the area and see how easily the hair comes off. If it is struggle, then wait another 5 minutes. To remove, just rinse with warm water and the hair will come off like magic. I used it on my bikini area since that area is so sensitive and I’m extremely fussy with the types of products I use in that region. I felt comfortable using this particular product because it contains naturally sourced ingredients. I’m now ready for the beach! 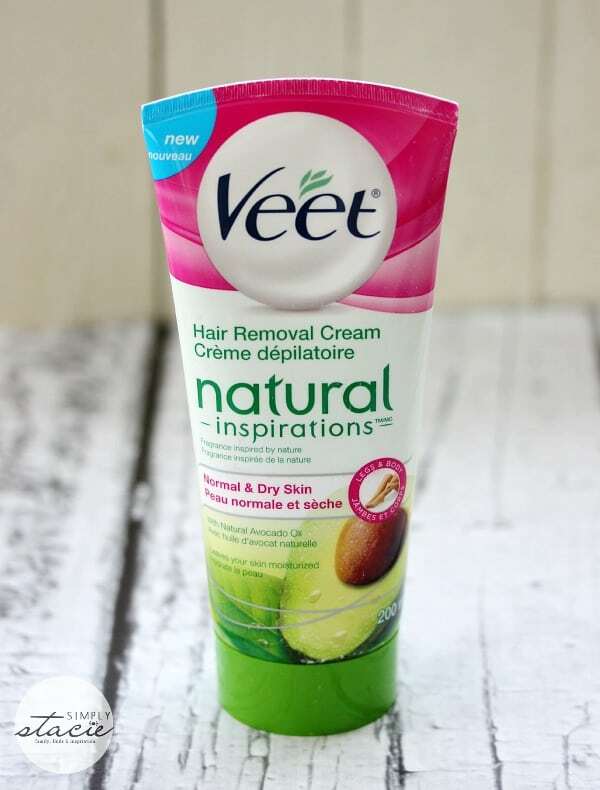 Veet Natural Inspirations Hair Removal Cream has an SRP of $12.49. Get soft, smooth and stubble free skin for up to 28 days with these naturally sourced facial wax strips. They include ingredients like pine resin and shea butter. Each pack contains 12 wax strips and 3 perfect finish wipes. 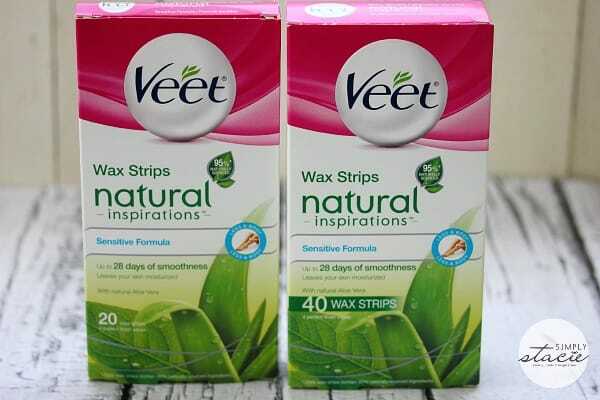 The wax strips also have Veet Easy Grip so it makes pulling them off a breeze. Thankfully, I don’t have to wax my face (yet anyways!). I’ll be passing these along to my mom to try. They have a SRP of $8.79. These strips are made with 95% naturally sourced ingredients like pine resin and aloe. They also have the Veet Easy Grip for ease of use. You can either buy the 20 pack or 40 pack that includes the 20 (or 40) wax strips and 4 perfect finish wipes. I saved the lower half of my legs for this one. They were looking pretty scary and I let the hair grow so there would be enough to wax. I was bracing myself for pain, but was shocked that it wasn’t even as bad as ripping off a band-aid. I thought to myself, “I can do this!”. I’d say that out of all the waxing products I’ve tried, these wax strips were the easiest to use and barely registered any discomfort. The Perfect Wipes sooth, moisturize and remove any excess wax residue on your skin. I’d recommend this product for anyone with sensitive skin. Don’t give up on waxing till you’ve tried this product! The 20 pack has a SRP of $12.99 while the 40 pack has an SRP of $21.99. 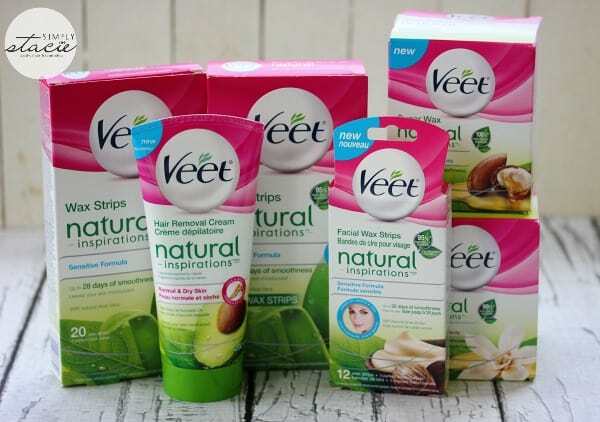 Want to try Veet Natural Inspirations? Look for the products in drug, mass merchants and grocery stores across Canada. I Really want to try facial cream kit. I constantly need to remove hair from my face region. Most other creams dry my face. I’d like to try the VEET Sugar Wax, mostly because I’m not familiar with it. Looking forward to trying the VEET sugar wax the most. I am looking forward to trying the Facial Wax Strips. I would love to try the sugar wax and give my mom the facial wax strips to try!